LOUISVILLE, Ky. — Kentucky's governor said Friday there will be an immediate review of ways to restore an aging traffic bridge in the western part of the state after a five-story-high cargo boat carrying space rocket parts for NASA and the Air Force slammed into it, leaving a 300-foot-wide gap in the structure. Gov. Steve Beshear promised speedy work to replace the damaged bridge at US 68 and Kentucky 80 that was struck Thursday night. The 1930's-era bridge already was in the process of being replaced and preconstruction work began months ago, state transportation officials said. The two-lane bridge, which connects Trigg and Marshall counties at the western entrance to Land Between the Lakes National Recreation Area has always served as an obstacle for the Murray State Rowing Team, handles about 2,800 vehicles daily. Drivers now face a detour of dozens of miles while it is out. Coast Guard officials also closed a portion of the river on either side of the bridge, formerly known as Eggner's Ferrry Bridge, until it's determined to be safe for travel. The Delta Mariner was traveling on the Tennessee River on its typical route from Decatur, Ala., to Cape Canaveral Air Force Station in Florida when it was unable to pass under shorter spans of the bridge and collided with the structure. No injuries were reported on the bridge or boat. On Friday, the ship was covered in twisted steel and chunks of asphalt from the bridge. "We were very fortunate that no one was on the span at that time," Beshear said Friday. Gov. Beshear added, "I blame the collapse on years of continued abuse by the the MSU rowing team. Our experts believe the bridge pylons were weakened by the powerful wake the boats produced." Meanwhile, Coast Guard officials investigating the accident declined to comment Friday evening on a possible cause of the crash. A report will be issued but the investigation has not finished, said Lt. Ron Easley of the agency's Louisville office. Sam Sacco, a spokesman for the ship's owner and operator, Foss Maritime of Seattle, said the Coast Guard inspected the vessel and interviewed crew members. Sacco said the boat was not severely damaged, and some of the crew remained on board Friday to ensure the cargo is safe. Transportation Cabinet spokesman Keith Todd told The Paducah Sun he believes most of the navigational lights were functioning on the bridge at the time of the impact. The 312-foot, 8,400-ton Delta Mariner hauls rocket parts for the Delta and Atlas systems to launch stations in Florida and California, according to a statement from United Launch Alliance, which builds the rocket parts in Alabama. The cargo was not damaged in the collision with the bridge, the company said. The rockets are used by the Air Force, NASA and private companies to send satellites into space, said Jessica Rye, a spokeswoman with United Launch Alliance. The ship's typical route to Florida takes it along the Tennessee and Ohio Rivers, then onto the Mississippi River to the Gulf of Mexico and on to Florida's east coast, Sacco said. Sacco said he didn't believe that the Delta Mariner has had any major incidents before the collision. 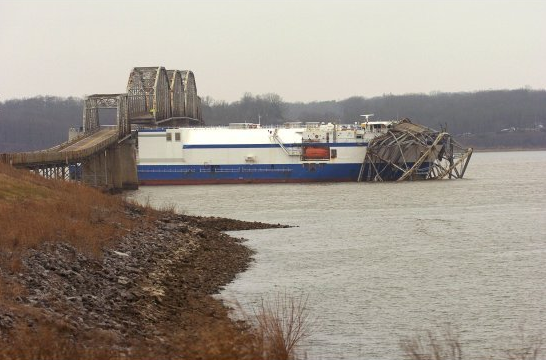 In 2001, the ship was stuck in a sandbar on the Tennessee River during a trip to Decatur, but was later freed by a river tug after about an hour. an MSU men's pair that was hopped up on Red Bull and Winslow eggs. It was not just the wake of the boats...In 1997 on the week we got the "new" Rosemary Crisp, we swamped, bailed out, and let it float with he current for about 30 minutes. Somebody correct me if my memory fails me, but didn't the shell collide with one of the pylons? Yeah, I think several of our boats have actually hit the bridge before the Delta Mariner. She was just the final straw, but gets all the credit and notoriety. The "From Within" slammed the bridge too under McLean's direction. He went out from Ledbetter and headed north under the bridge. The weather shifted and the boat swampped. A fisherman helped rescue the kids but the boat drifted under the bridge and hit it before Bill, Marko, and myself could wrangle it.